Hollywood loves its Biblical epics. From the 1903 production of Samson And Delilah to last year’s Exodus: Gods And Kings, the magic factory of celluloid and vanity rarely meets a Bible story it doesn’t try to spin into a film. (No doubt we can soon look forward to the CGI-heavy spectacle of Lots More Loaves Of Bread And Fish Than Expected: The Movie). But even better are stories featuring the big man himself, Jesus Christ. And regardless of any facts or logic that may suggest otherwise, Hollywood likes its Jesuses (Jesi?) to be white as the new-fallen snow. 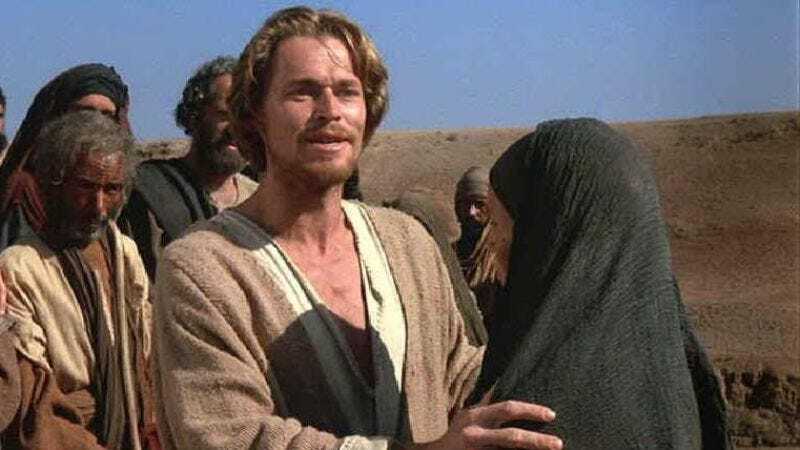 Fusion has put together a supercut—nay, a miraculous supercut, blessed by the Holy Father himself—of portrayals of the Son of God, and it’s a blindingly Caucasian affair. Not to say that it isn’t a delight to see John Turturro at the end, joyously caressing his bowling ball, but that cutesy nod aside, it’s all white dudes hanging out in robes, blessing people and whatnot. Unlike many fundamentalist Christians, we come not to judge, but merely observe. After all, we here at The A.V. Club like our Jesus the way we like our conspiracy theories: historically inaccurate.